I know coin hours accumulate at the rate of 1 coin hour per skycoin per hour and this is to be used to power transactions and to also avoid spamming the network. 1. When skycoin is being sent, how is it calculated the amount of coin hours burned and the amount of coin hours sent to the receiving address? 2. Since there is a total hardcap of 100,000,000 skycoins which means the theoretical maximum rate of coin hours generated per day is 2.4 billion. What happens when there are so many users/transactions on the network where the consumption is greater than 2.4 billion coin hours? In practice it will be less than this as not all coin hours will be available for people to use readily. eg hodlers, lost wallets etc.. Assuming coin hours will be separately tradeable like Neo's gas, this means the price of coin hours will keep increasing making the network more and more expensive to use. 3. 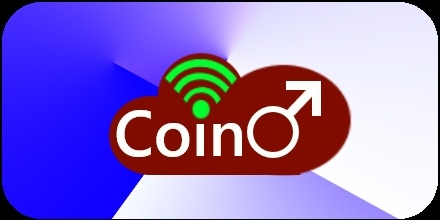 Vice versa if there is not enough users to consume the 2.4 billion coin hours generated per day by the entire network then the value of coin hours will be ever decreasing. When coin hours are practically valueless, what is the incentive for node owners? When all skycoin have been released and coin hours have low value. 4. Currently who is validating the transactions on the blockchain as there seems to be no incentive to do so as coins are not mined or staked. 5. The future wifi miners, how are they going to connect to the rest of the world in remote countries or where countries is entirely surrounded by water. eg Australia. 6. If the node locations are not dense enough in one area, does that mean a cluster of nodes are effectively isolated from the rest of the network and the world? (01-28-2018, 11:15 AM)drawoh Wrote: 1. When skycoin is being sent, how is it calculated the amount of coin hours burned and the amount of coin hours sent to the receiving address? I will try to answer your questions seperately. 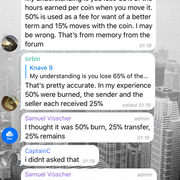 1) Every transaction with skycoin "burns"/removes 50% of your wallet. The remaining 50% is split between you and the recipient. So 50/25/25. As you can read below the ratio has been changed and can be changed in the future. Questions+answers are easy tp find using the telegram search function. (01-28-2018, 11:15 AM)drawoh Wrote: 2. What happens when there are so many users/transactions on the network where the consumption is greater than 2.4 billion coin hours? 3. When coin hours are practically valueless, what is the incentive for node owners? Skycoin and coinhours will be interchangable. The exact rate isn't clear yet. 2) There will be more coinhours than 2.4 billion. 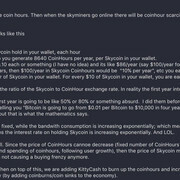 3) Collecting coinhours and changing them into skycoins is the incentive for node owners. Current time: 04-23-2019, 06:11 AM Powered By MyBB, © 2002-2019 MyBB Group.